The Discovery Center will open at 9 AM on Wednesday, April 3. Please call 1-877-MY PARKS (697-2757) with any questions regarding school/group tours. Kartchner Caverns is a stunning limestone cave in Southeastern Arizona and boasts many world-class features that have been protected since the cave was discovered in 1974. The cavern has been surveyed at 2.4 miles long. Kartchner is a wet, “live” cave. Water percolates from the surface and calcite features continue to grow in the darkness. The park offers two cave tours where you'll see dynamic structures such as stalactites dripping down like icicles and giant stalagmites reaching up from the ground, sometimes meeting to form a massive column. 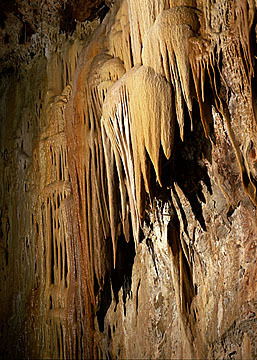 The caverns are host to a wide variety of unique minerals and formations. The park includes a Discovery Center which houses world-class exhibits, a large gift shop, regional displays, and educational information about the caverns and the surrounding landscape. There are also campgrounds, hiking trails, shaded picnic areas, a vending area, and an amphitheater. Kartchner Caverns is now following established nationwide protocols to prevent the spread of White Nose Syndrome, a fungal disease that is killing bats. We request that if you have been in another cave or mine since 2005 you do not wear or bring any of the same clothes or shoes as on your other cave trips. If you arrive to Kartchner Caverns wearing shoes that have been in another cave, you will be asked to visit a White Nose Syndrome Decontamination Station, where your shoes will be sprayed down with rubbing alcohol to kill the fungus. Thank you for working with us to protect our bats! Allow at least three hours for the entire park experience, which includes a cave tour, a walk through the visitor center exhibits, gift shop, and enjoyment of the outdoor scenery. When taking a cave tour, one adult must accompany every seven children on the tour for sc hool groups. All tours are guided by a trained tour guide. Reservations are strongly recommended and can be made by calling: (520) 586-CAVE. The cave averages 70° Fahrenheit (21° Celsius) and 99 percent humidity year round. All cave trails are barrier-free. Due to wet surfaces and changes in grades, strollers and walkers are not allowed on the tours. Children age 6 and under are not allowed on the Big Room Tour. 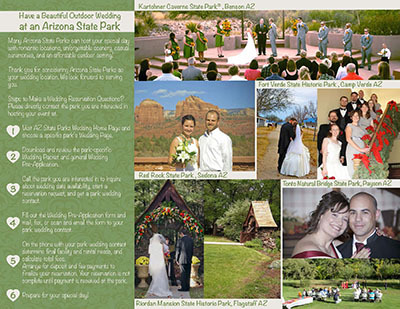 Arizona State Parks has developed an entire school curriculum on CD for teachers Kindergarten through sixth grade. If you would like to receive a complimentary copy of the Kartchner Caverns State Park curriculum (available in CD ROM format) for your school or organization, please call 1-877-MY PARKS (697-2757). Natural History Curriculum for Grades K - 6th: The goal of this curriculum guide is to assist you in conveying the unique story of Kartchner Caverns to your students. Through the lessons to be learned in these activities, the students will develop an appreciation of the geological and biological forces that created such a magnificent cave. We hope, also, to promote an understanding of the interrelationship between humans and Kartchner Caverns. We encourage the students to think about the choices that were available in the development of the cave and the consequences of each. Finally, and most importantly, we hope that through the use of these activities the learners will gain a sense of ownership and stewardship toward this non-renewable natural resource. Each activity includes the approximate age for which it was designed, a listing of the lesson's objectives, reproducible pages, materials' list, glossary of terms, cross-referencing, and other useful information that will assist teachers in dynamically presenting the curriculum. The curriculum meets state standards for science education. You may download a complimentary copy of the Kartchner Caverns State Park curriculum for your school or organization. Parks have rules and regulations for the safety of students as well as other visitors. These rules are for all school groups, Boy Scouts, Girl Scouts, kids clubs, and organizations. Kartchner Caverns is a world-class show cave. Preservation of this outstanding resource is our top priority. Your school will be interacting with other visitors from all over the world and will leave a lasting impression with them. Your careful attention to the guidelines listed below will ensure a memorable and educational experience for all. Thank you for your cooperation and we hope you enjoy your visit. Please review the following information with teachers, chaperones, and students prior to your scheduled visit. Teachers/chaperones are responsible for the behavior of each student at all times during your visit. Teachers/chaperones must stay with their assigned students while on the park grounds, in the exhibit areas, in the theater, in the gift shop, in the café, on the tram and in the caverns. The large ramada may be used for lunch; please do not use the café seating area. Please DO NOT wear name tags as they often fall off and can litter the trails. There are medical packs available for visitors that need to bring inhalers/medicines on their tour. The Discovery Center is an institute of learning. We need your help by using INSIDE VOICES ONLY …at times the noise level can become disruptive to the other guests and to the operation of the Discovery Center. Upon your arrival your group will be met by park staff to review rules and regulations. VIDEO PRESENTATION - There is a 15 minute video that can be watched before or after the cave tour. MUSEUM/EXHIBIT AREAS – All the exhibits are to be used as learning tools, they are not toys. Please do not climb on top of the rock walls or other exhibits in the Discovery Center. Running is not permitted inside the Discovery Center or any of the surrounding areas. EVERYONE needs to leave the following items on the bus: backpacks, purses, cameras, flashlights, CELLPHONES, water bottles, fanny packs, and ALL ELECTRONICS. Gift Shop purchases should be made AFTER your tour. Teachers, chaperones and students need to follow all the cavern rules. Any group not following these rules may be asked to leave the Discovery Center/Caverns. Restrooms are located at the entrance to the Discovery Center and on the back patio. Please make sure your group uses the drinking fountains and restroom before their tour. Touching or damaging formations is strictly prohibited and punishable by law. A chaperone will have to exit with their assigned students if they have to leave the cave for any reason. Please be respectful of others while on your tour and use inside voices at all times. Jackets are NOT encouraged for cave tours. It is exceptionally warm year round inside the caverns. Your tour guide will show you the proper method of how to carry jackets during colder times of the year. You will be riding a tram to and from the cave, please follow the instructions of your Tour Guide and driver. For your safety, stay seated and please keep hands, arms, legs and feet inside at all times. A teacher or chaperone needs to ride in the back seat of each tram car. When visiting the Gift Shop or Café, the staff will meet you in the front of the store. The staff will explain the appropriate behavior that needs to be followed. Gift shop purchases should be made after your tour. We hope you enjoy the many souvenirs/items that are available for you to purchase. If you plan on using the hiking trails children 16 years or younger MUST be accompanied by an adult. Be sure to take plenty of water with you while on your hike. Stay only on the designated trails. The bridge, tram roads, and campgrounds are off limits. Climbing or hiking on top or near the entrance to the caverns is prohibited. All plants, animals, flowers, rocks, and natural features are protected. Please do not damage, destroy or remove them from the park. Restrooms are located at the entrance to the Discovery Center and on the patio behind the Discovery Center. Reservations are strongly recommended to guarantee a tour. Reservations can be made by calling the group/school reservation number at 1-877-MY PARKS (697-2757). School group planners have the opportunity to make arrangements with a specialized phone reservation attendant. Reservations are taken from 8 a.m. to 5 p.m., (MST) M-F. Office is closed Christmas Day. Reservations can be made up to a year in advance. There are no blocked group tours on Saturday or Sunday. When taking a cave tour, one adult must accompany every seven children on the tour for school groups. We are unable to accommodate preschool, kindergarten, or 1st grade school tours. A tour confirmation letter will be mailed and tickets can be picked up at the park's "will call counter" one hour prior to the tour time. It is recommended that visitors arrive approximately one hour prior to tour time. If a group fails to show, reservations may be canceled 15 minutes prior to tour time. Group tours can load and unload in front of the Discovery Center. The driver is welcome to visit the Discovery Center and any other above ground park facilities, including the restrooms, food concessions, and picnic areas. The park has adequate restroom facilities to accommodate a tour group. Payment is due either in full when the reservation is made using a credit card (Visa or MasterCard) or with a company check or money order, made payable to Kartchner Caverns State Park. Payment must be received one month prior to the tour date or the park will cancel the reservation (cashiers check or school direct check must be made payable to Kartchner Caverns State Park). Please familiarize yourself with our park's Accessibility Information and our very important Park Rules. Cave tour tickets are extra. Entrance fee waived for cave tour and campsite reservations. In November 1974, Gary Tenen and Randy Tufts were exploring the limestone hills at the eastern base of the Whetstone Mountains. They were looking “for a cave no one had ever found” and found it. The two kept the cave a secret until February 1978 when they told the property owners, James and Lois Kartchner, about their awesome discovery. Since unprotected caves can be seriously damaged by unregulated use, they knew the cave had to be protected. Tenen and Tufts spent several years looking into the possibility of developing the cave themselves. Some members of the Kartchner family lived in Tucson and were very impressed with the development and operation of Catalina State Park by Arizona State Parks. They decided to approach State Parks to see if the agency was interested in acquiring this outstanding resource.